together contain all the information about the Issuer, the Guarantor and the Securities offered. A summary for the specific issue is appended to these Final Terms. the Securities is a new issue. The Cash Amount shall correspond to the Reference Price of the Underlying on the Valuation Date divided by the Ratio. Settlement Currency at the Conversion Rate. heading "Euro Foreign Exchange Reference Rates". shall mean each tenth (10 ) Business Day before an Exercise Date. The Securities shall be governed by German Law. shall mean 19 February 2015. The Ratio shall be expressed as a fraction and shall amount to 100 : 1.
of the Securities shall mean SEK. shall be ten (10) Business Days prior to the relevant Termination Date. The composition and calculation of the Factor Index specified above is described in the following. guide constitutes the basis for calculating and publishing the Factor Index. The Factor Index reflects price movements in the Reference Instrument with a leverage factor of 18.
the Factor Index and vice versa. The Factor Index therefore replicates a "short" strategy. The Factor Index consists of a leverage component and a financing component. effect on the value of the Factor Index. A decrease in the price of the Reference Instrument (as compared to the most recent adjustment) by 2% results in an increase in the Factor Index by 18 x 2%. Reference Instrument (or its constituents), selling it and investing the proceeds at the risk-free rate. the Factor Index is added (Index Fee which reduces the value of the index). Rate on a particular day, the value of the Factor Index is reduced on such day. The definitions below shall apply for the purposes of this index description. "Adjustment Date" means the first Index Calculation Day of each calendar month. securities included in the Reference Instrument and their weightings remain the same. that no adjustment were to be made. on the basis of the most recent prices set for the Reference Instrument in its due discretion. from the relevant Adjustment Date. "Initial Financing Spread" is 6.0% per annum. "Trading Day" means every day on which the Reference Instrument is calculated by the Reference Exchange. on the relevant Factor Index. The negative sign for the Leverage indicates that the Short Factor Index participates inversely in, i.e. in the opposite of, the performance of the Reference Instrument. 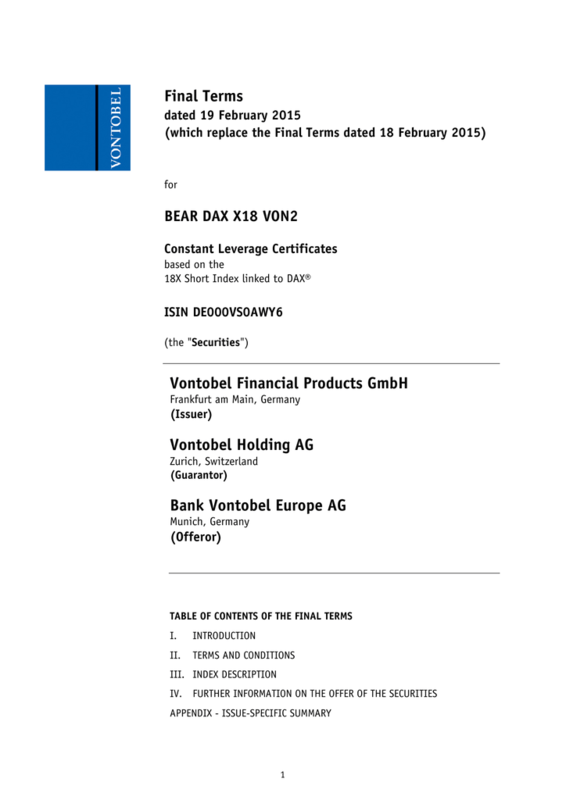 "Index Calculation Agent" means Bank Vontobel AG, Gotthardstrasse 43, 8002 Zurich, Switzerland. "Index Calculation Day" means every day from Monday to Friday. the Reference Instrument for this Index Calculation Day and published in accordance with section E) of this index description. "Index Start Date" means 19 February 2015. Day T=0 for the purposes of calculating the index in accordance with C). "Reference Instrument Price" corresponds at any time during the calculation period of the Reference Instrument to the price of the Reference Instrument, as calculated by the Reference Exchange and determined by the Index Calculation Agent. "Reference Exchange" means Deutsche Börse. If the Interest Rate is not set or published on an Index Calculation Day, the Interest Rate applied on the immediately preceding Index Calculation Day is used to calculate the index in accordance with section C). discretion an alternative relevant Interest Rate which has functions comparable to the previous Interest Rate. Reference Instrument on the Reference Exchange on each Index Calculation Day, rounded to two decimal places and published in accordance with section E). One index point corresponds to one unit of the Index Currency. Valuation Price (RT-1 (old)) by 1.05. The financing component remains unchanged. No additional costs are incurred for the newly simulated day. component as if no Extraordinary Adjustment Event had occurred. Exchange for futures and options linked to the Reference Instrument traded there. the stipulation of a different Reference Exchange, Derivatives Exchange or Reference Instrument Price. apply in addition to the provisions set out above. concept will be used in the future as a basis for calculating the Factor Index. in this index description shall be deemed to refer analogously to the Substitute Reference Exchange. level shall be determined solely on the basis of the remaining components of the index formula. which the relevant futures or options are traded on the Derivatives Exchange after taking the adjustment into account, or would be so traded if corresponding futures or options were traded on the Derivatives Exchange. by the Index Calculation Agent in accordance with section E). shall be deemed to have been given on the date on which they are first published. Notices are made for informational purposes only and do not represent a precondition for legal effectiveness. 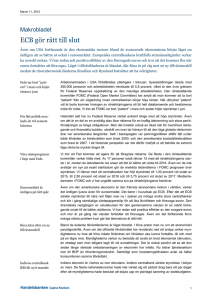 Nordic Growth Market (Nordic Derivatives Exchange Sweden, NDX). The Public Offer will end with the term of the Securities, but at the latest with the expiry of the validity of the Base Prospectus. The end of term is specified in chapter II. Terms and Conditions. to publish any post-issuance information. numbered in Sections A – E (A.1 – E.7). gaps in the numbering sequence of the Elements. further supplemented (the "Base Prospectus" or the "Prospectus"). 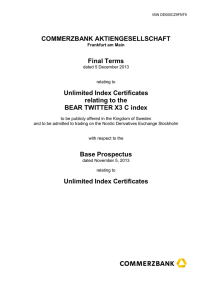 the Final Terms published in connection with the issue of the Securities. 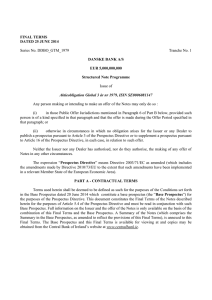 to bear the costs of translating the Base Prospectus before the legal proceedings are initiated. AG (the "Offeror") and Vontobel Holding AG (the "Guarantor") have assumed responsibility for this summary including the translation thereof. Prospectus, or if, when read together with the other parts of the Base Prospectus, it does not provide all the key information required. public offer of the Securities in Sweden ("Public Offer") (general consent). at the time the offer is made. 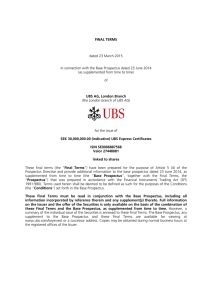 The legal and commercial name of the Issuer is Vontobel Financial Products GmbH. cooperation procedure, cannot be foreseen at the present time. banking group with international activities. accordance with the requirements of German Commercial Code (Handelsgesetzbuch, "HGB") in each case). (Amtsgericht) at Frankfurt am Main under the register number HRB 58515. A profit forecast or estimate has not been included. There are no such qualifications. 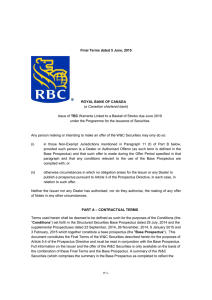 The following selected financial information has been taken from the Issuer's unaudited interim financial statements as at 30 June 2014 (in accordance with HGB). 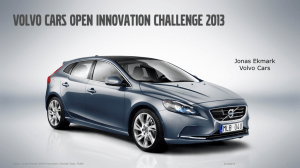 since the date for its last published audited financial statements (31 December 2013). With respect to the organizational structure, see B.5. There have been no significant changes in the financial or trading position of the Issuer subsequent to the period covered by the historical financial information (30 June 2014). material extent relevant to the evaluation of the Issuer's solvency. The Issuer has no subsidiaries. other countries, or acquire interests in other companies. company of the Vontobel Group. There is no control agreement and no profit and loss transfer agreement between the Issuer and Vontobel Holding AG. the terms and conditions (the "Terms and Conditions") of the Securities issued under the Base Prospectus is guaranteed by the Guarantor. 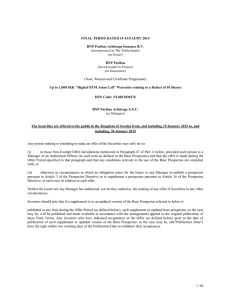 rights and obligations arising from the Guarantee are subject in all respects to Swiss law. The courts of law of the Canton of Zurich have exclusive jurisdiction over all actions and legal disputes relating to the Guarantee. The place of jurisdiction is Zurich 1. The Guarantor's legal and commercial name is Vontobel Holding AG. Gotthardstrasse 43, 8002 Zurich, Switzerland. listed on the SIX Swiss Exchange AG and was incorporated in Switzerland. ich under register number CH-020.3.928.014-4. of banks, capital markets companies and other Swiss and foreign companies. The Guarantor holds all of the shares in the Issuer. 2012 and 2013 (in accordance with IFRSs in each case). At the present time, the Vontobel Group only has Common Equity Tier 1 (CET1) capital. 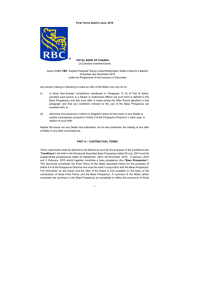 reserves, liability reserve, fund for general banking risks). Investment Banking business unit. Historical simulation of Value at Risk; 99% confidence level; 1-day holding period; 4-year historical observation period. level; 1-day holding period; 4-year historical observation period. financial information (30 June 2014). other aspects of the organisational structure, see B.19 with B.5 above. a material extent relevant to the evaluation of the Guarantor's solvency. Description of the Pursuant to Article 2 of the Articles of Association, the object of the Guarprincipal activities antor is to invest in companies of all types in both Switzerland and abroad. in particular Bank Vontobel AG. three business units, Private Banking, Investment Banking and Asset Management. of the subsidiaries (own shares with no voting rights) and executive members (the "Pool Members"). holds a total of 12.5% of the shares in the Guarantor. 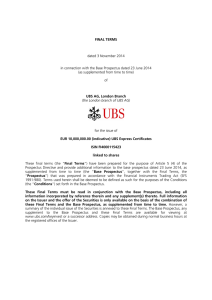 The Guarantor had formally exercised its repurchase right on 29 July 2014. (the "SFIA Act") to the effect that there will be no certificated securities. No definitive securities will be issued. The currency of the Securities is SEK (the "Settlement Currency"). The Securities are freely transferable. Amount, as described in C.15. The form and content of the Guarantee and all rights and obligations arising from it are determined in accordance with Swiss law. ment C.20 below), or may terminate the Securities extraordinarily. price for the Underlying that is relevant for the purposes of valuing the Securities. same way as the Cash Amount) and to end the term of the Securities. 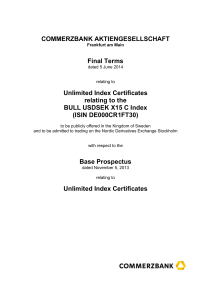 the Nordic Growth Market (Nordic Derivatives Exchange Sweden, NDX). comparable to a direct investment in the underlying or the Reference Instrument. affiliated to the Issuer. It consists of a leverage component and a financing component. in the case of both positive and negative movements in the Reference Instrument. (as defined in C.19) under consideration of the Ratio. See also the issue-specific information under C.16. exercises the Securities effectively or when the Issuer ordinarily terminates the Securities. (b) in the event of an ordinary termination by the Issuer, the ordinary termination date. under the Securities in the amount of such payment. Day, the payment may be postponed until the next following Business Day. be found under C.15 to C.17. The Cash Amount is converted into the Settlement Currency of the Securities on the Valuation Date in accordance with the relevant conversion rate. The amount of the Cash Amount depends on the Reference Price of the Underlying on the Valuation Date. Date, as calculated and published in accordance with the index description. be unable to fulfil all or some of its obligations arising from the Securities. loss, irrespective of the performance of the Underlying. in part if the Issuer became insolvent. the case of an issuer with a higher level of capital resources. companies affiliated to the Issuer could therefore result directly in the illiquidity of the Issuer. in the respective countries (known as market risk). but also the creditworthiness of the Guarantor when making their investment decisions. in part if the Guarantor became insolvent. prices and the related volatilities, and have a negative impact on the valuation of the underlyings and/or derivative financial products. of another financial instrument, the Reference Instrument. In the case of Securities linked to Factor Indices of the short type, an increase of the Reference Instrument is disadvantageous for the investor. price of the Underlying and therefore also in the price of the Securities. the price of the Factor Index and therefore also of the Security. the investor, there is a risk of loss up to and including a total loss. entailed in an investment in such a Reference Instrument) are therefore also reflected in principle in the price of a Security. and the performance of the economy as a whole). greater potential for incurring losses. The performance of an underlying, of its reference instrument or of a security in the past is not an indicator of its performance in the future. Investors may not be able to hedge adequately against the risks associated with the Securities. return generated in real terms. the price of the Underlying and therefore on the performance of the Securities. at fair market prices or not be able to sell at all. mathematical value of the Securities (so-called fair value) that is not apparent to the investor. may be subject to taxes, levies, fees, deductions or other payments required to be made, paid, withheld or deducted. may have a negative impact on the value of the Securities. the least favourable case, a total loss of the capital invested may occur. and may entail a loss up to and including a total loss. risks for investors as in the case of ordinary termination. possible conflicts of interest are set out under E.4. may move in a direction that is to their disadvantage. currency of the investor or the currency in which an investor wishes to receive payments, potential investors bear exchange rate risks. and therefore the level of the Underlying. The Securities are particularly risky investment instruments, which combine features of derivatives transactions with those of leveraged products. of the Issuer and of the Guarantor. with the result that in certain circumstances investors may suffer a total loss of their investment. The Issue Price of the Securities was determined by the Market Maker. therefore the value of the Securities. negative impact on the Underlying and the value of the Securities. models and a number of other factors. own interests in the course of making an investment decision or investment recommendation. The investor may purchase the Securities at the Issue Price or at the selling prices quoted by the Market Maker during the term of the Securities. fee and, where applicable, the financing component, see C.15 above). the Issue Price or the selling price. förekomma luckor i numreringen av Elementen. Emittenten och Anbudsgivaren samtycker till att använda Grundprospektet för ett allmänt erbjudande som gäller Värdepapperna i Sverige (“Offentligt erbjudande”) (allmänt samtycke). med kapitel 9 i den tyska lagen om Värdepappersprospekt (Wertpapierprospektgesetz, “WpPG”). handahålla informgäller i vederbörande jurisdiktion. vid den tidpunkt då erbjudandet läggs fram. den lokala domstolens (Amtsgericht) i Frankfurt am Main med registernummer HRB 58515. 2013 genom förfarandet för fördjupat samarbete. Vontobelkoncernen grundades år 1924 och har sitt säte i Zürich. Koncernen bedriver bankverksamhet och är även aktiv internationellt. Ingen resultatprognos eller -beräkning innefattas. Det finns inga sådana anmärkningar. den 31 december 2012 och 2013 (enligt kraven i den tyska handelslagen (Handelsgesetzbuch, “HGB”) i varje enskilt fall). 2014 (i enlighet med HGB). gäller Emittentens framtidsutsikter sedan den 31 december 2013, vilket är datumet för dess senaste publicerade reviderade årsredovisning. Vad beträffar den organisatoriska strukturen, se B.5. 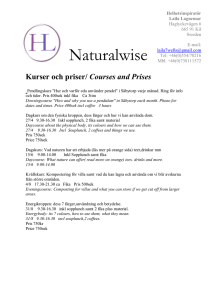 Värdepapper som emitteras i enlighet med Grundprospektet. som krävs för att uppfylla syftet med Garantin. sätt som anges i de Allmänna Villkoren, under alla faktiska och juridiska omständigheter och oavsett motivering, försvar eller invändningar vad beträffar skälet till att Emittenten inte gjort betalningarna, samt oavsett hur effektiva och verkställbara Emittentens förpliktelser är under Värdepapperna. Garantin utgör en självständig Garanti i enlighet med schweizisk lag. rör Garantin. Domstolarna i Zürich 1 är behöriga i detta hänseende. Garantigivarens registrerade namn och handelsbeteckning är Vontobel Holding AG. Gotthardstrasse 43, 8002 Zürich, Schweiz. särskilt värda att nämnas som viktiga påverkande faktorer. banker, företag på kapitalmarknaderna och andra schweiziska och utländska företag. Garantigivaren innehar alla aktier i Emittenten. (Schweiz). Den publicerar kapitaltäckningskrav och liknande andelar för eget kapital. För närvarande har Vontobelkoncernen endast kärnprimärkapital (CET1). består främst av inbetalat kapital (aktiekapital) och balanserade vinstmedel (inkomstreserver, skuldreserv, fond för allmänna risker i bankrörelsen). 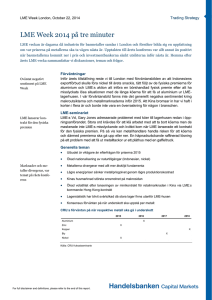 som avslutades den 30 juni 2014 (i enlighet med IFRS). vilket är datumet för dess senaste publicerade reviderade årsredovisning. 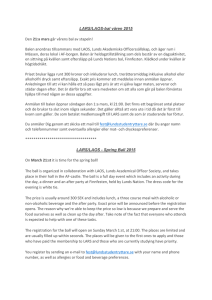 organisationsstrukturens övriga aspekter, se B.19 med B.5 ovan. Garantigivarens affärsverksamhet påverkas därför särskilt av de operativa Vontobelföretagens situation och verksamhet (konsoliderat). syfte att investera i alla slags företag, både i Schweiz och utomlands. Garantigivaren är moderbolag i Vontobelkoncernen, vilket särskilt innefattar Bank Vontobel AG. samt samarbetspartners och är verksam genom tre affärsenheter, privat bankverksamhet (Private Banking), investeringstjänster (Investment Banking) och tillgångsförvaltning (Asset Management). Poolmedlemmarna deltar i ett poolingavtal för aktieägare som omfattar vissa aktier i Garantigivaren som definieras i avtalet. Den 31 december 2013 var 40 % av alla emitterade aktier bundna av poolingavtalet för aktieägare. Försäljning av aktier i Garantigivaren som omfattas av poolen kräver förhandsgodkännande av poolmedlemmarna. Poolmedlemmarna disponerar fritt över eventuella övriga aktier. Genossenschaft den 7 juni 2004, vilket medförde att Raiffeisen Switzerland Genossenschaft innehar totalt 12,5 % av aktierna i Garantigivaren. Genossenschaft innehar, i syfte att dra in dessa aktier. Raiffeisen Schweiz Genossenschaft till Garantigivarens ordinarie bolagsstämma som ska hållas 28 april 2015.
innebär att det inte förekommer några fysiska Värdepapper. Inga definitiva Värdepapper kommer att emitteras. Valutan för Värdepapperna är SEK (“Avräkningsvaluta”). Värdepapperna ger Värdepappersinnehavaren rätt att kräva att Emittenten löser in Värdepapperna då dessa förfaller eller vid inlösen genom att betala ett Kontantbelopp så som beskrivs i C.15. med tysk lag, med undantag för att registrering av Svenska Registrerade Värdepapper omfattas av svensk lag. den medför, fastställs i enlighet med schweizisk lag. Enligt de Allmänna Villkoren kan Emittenten göra justeringar vid förekomsten av definierade händelser för att ta hänsyn till relevanta förändringar eller händelser som är knutna till ifrågavarande Underliggande (enligt definitionen i Element C.20 nedan) eller kan extraordinärt avsluta Värdepappernas löptid. gottfinnande fastställa en kurs eller nivå eller ett pris för Underliggande som är relevant för värderingen av Värdepapperna. Growth Market (Nordic Derivatives Exchange Sverige, NDX). vissa av Värdepappernas egenskaper kan man inte jämföra investeringen in Värdepapperna med en direkt investering i underliggande eller Referensinstrumentet. 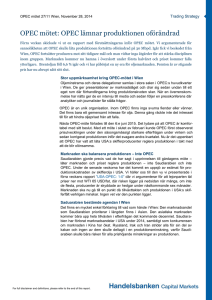 handel är 19 februari 2015.
består av en hävstångskomponent och en finansieringskomponent. Faktorindexet. Faktorindex replikerar därför en investering i Referensinstrumentet men rörelser i priset för Referensinstrumentet multipliceras med Faktorn. Den här hävstångseffekten inverkar oproportionerligt på Faktorindexets värde vad beträffar både de positiva och negativa rörelserna i Referensinstrumentet. relevanta räntekursen en viss dag, reducerar finansieringskomponenten Faktorindexets värde. (såsom definierat i C.19) med beaktande av Graden. Se även den emissionsspecifika informationen under C.16. the ordinära dagen för uppsägning. Förfallodag: den nionde (9:e) arbetsdagen efter Värderingsdagen. instruktioner befriar Emittenten från dess betalningsförpliktelser under Värdepapperen mostsvarande det överförda beloppet. kan betalningen förläggas till följande arbetsdag. under punkterna C.15 till C.17. Värderingsdagen, i enlighet med relevant omräkningskurs. Kontantbeloppets storlek är beroende av Referenspriset för Underliggande på Värderingsdagen. Index linked to DAX® (det ”Underliggande”), vilket skapas och beräknas av beräkningsagenten för index. beräknas och publiceras i enlighet med indexbeskrivningen. förluster, inklusive möjlig totalförlust, oavsett hur Underliggande presterar. delvis om Emittenten blir insolvent. 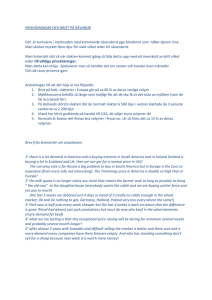 påverkas av det allmänna läget inom världsekonomin samt ifrågavarande länders ekonomiska och politiska ramar (så kallad marknadsrisk). de fattar investeringsbeslut, utan även Garantigivarens kreditvärdighet. helt eller delvis om Garantigivaren blir insolvent. vad beträffar likviditeten som till exempel kan orsakas av kassautflöden när låneåtaganden utnyttjas eller när det inte går att förnya insättningen, vilket medför att Garantigivaren tillfälligt kan vara oförmögen att uppfylla kortfristiga finansieringsbehov. det ogynnsamt för investeraren om Referensinstrumentet stigger. som används för att beräkna Faktorindexet kan även sidorörelser i Referensinstrumentet leda till betydande fall i Faktorindexets och därmed även i Värdepapprets pris. är ogynnsam för investeraren föreligger en förlustrisk som kan inkludera totalförlust. 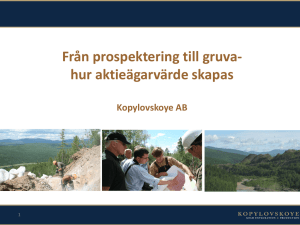 i Referensinstrumentet) återspeglas därmed i princip även i Värdepapprets pris. riskabel, eftersom den medför större möjlighet för förluster. Hur underliggande, dess referensinstrument eller värdepapper har presterat tidigare är inte en indikation på hur de presterar i framtiden. som är anknutna till Värdepapperna. samt på den avkastning som faktiskt genereras. en fas som är ogynnsam ur investerarens synvinkel. inverkan på Underliggandes pris och därför Värdepapperens prestation. eller för att de alls kan sälja dem. kallat skäligt värde) som inte är uppenbart för investeraren. eller andra betalningar som måste göras, innehållas eller dras av. kan ha en negativ inverkan på Värdepappernas värde. fallet kan hela det investerade kapitalet gå förlorat. kan återinvestera på mindre gynnsamma villkor. Om Avräkningsvalutan för Värdepapperna inte är densamma som valutan där investeraren är bosatt eller valutan där investeraren vill erhålla betalning, är möjliga investerare utsatta för valutarisk. Faktorindexets värde och därmed Underliggandes nivå minskar. kombinerar som kombinerar egenskaper som återfinns i både derivattransaktioner och hävstångsprodukter. Värdepapperna är därför förknippade med oproportionerliga förlustrisker (risk för totalförlust). att investerarna förlorar hela investeringen. Värdepappernas Emissionspris fastställdes av Market Maker. Underliggandes värde och därmed på Värdepappernas värde. på Underliggande och Värdepappernas värde. både mellan vederbörande företag inom Vontobelkoncernen och mellan dessa företag och investerarna, vid fastställandet av Värdepappernas pris och vid andra tillhörande fastställanden. interna prissättningsmodeller och ett antal andra faktorer. bredda eller minska spridningarna mellan anbuds- och erbjudandepris. Investeraren kan köpa Värdepapper till emissionspris eller till försäljningspris som anges av Market Maker under Värdepappernas löptid. är tillämpligt, finansieringskomponenten, se C.15 ovan). Uppgifter om eventuella transaktionskostnader bör begäras av vederbörande försäljare eller av investerarens egen bank eller mäklare. Förutom Emissionspris eller försäljningspris kommer Emittenten och Anbudsgivaren inte att debitera investeraren för några ytterligare kostnader.